It's time for the annual Recipe Days bake-off in Lubbock, Texas. Soccer moms and grandmothers gather to show off their family recipes, learn new secrets for the perfect shortcake, and perhaps earn a chance to be on the famous cooking show, How Would You Cook It, Then? When the bake-off is crashed by a federation of pro wrestlers -- including American Badass, Jersey Devil Jill, Tiny Giant, The Village Person, Jonah the Whale, the Hellbillies, and the fan favorite Xombie -- all hell is set to break loose. Your heart beats faster as you anticipate who will come out on top in the ultimate showdown of the century: soccer moms or pro wrestlers. Anything can happen. An infected batch of donuts has transformed most of the wrestlers into mindless brain-eaters and the doors of the convention center have been chained shut, leaving the survivors locked inside, forced to fend for themselves against the hungry dead. 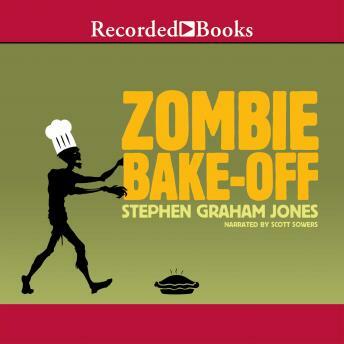 Possessing the intensity of a shotgun to the face, Zombie Bake-Off is a stripped-down masterpiece of blood and doughnuts from celebrated author Stephen Graham Jones.